The first purely plant-based DHA omega-3 fatty acids in algae oil - without fish oil! 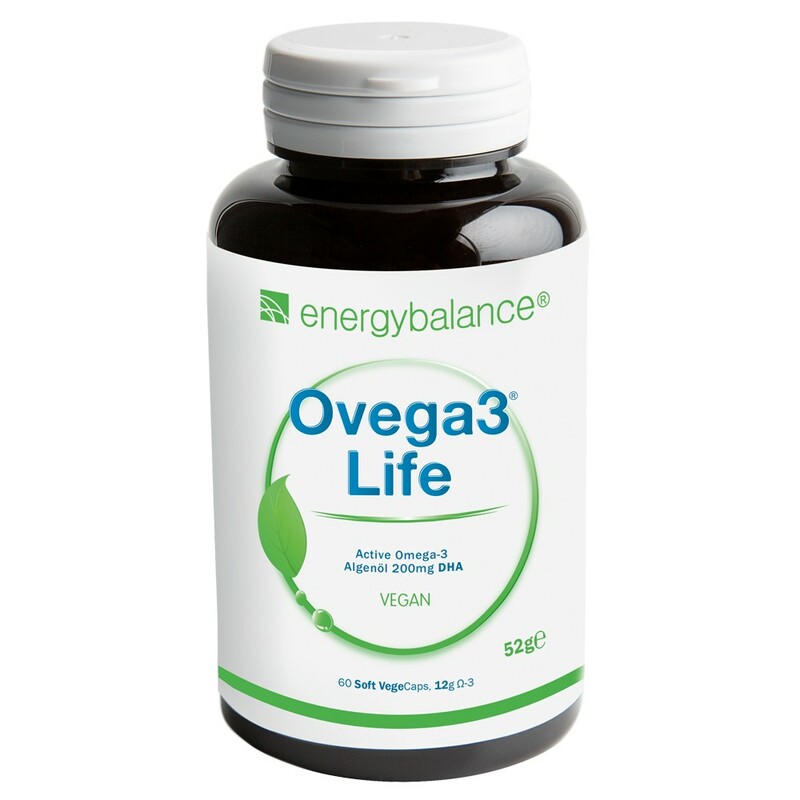 The essential omega-3 fatty acids with the active ingredient DHA contained in Ovega3™life come from algae oil. DHA algae oil and the capsules we use are vegetarian and 100% pollutant free. This product is also suitable for vegetarians and vegans. Ovega3™life is a high-quality product but more affordable than competitor products. Please see the price comparison provided in the product information. Ovega3™life contains the active omega-3 substance DHA, docosahexaenoic acid. This active omega-3 substance is important for our bodies and cannot be compared to other omega-3 fatty acids, which come in the form of ALA, alpha linolenic acid. ALA, alpha linolenic acid, is not an active substance and first needs to be turned into the active omega-3 substances, DHA, EPA, DPA or OTA, by our bodies in a complex process. 90% of the substance is lost when our body turns ALA into DHA. That means that out of 2,000mg of omega-3 alpha linolenic acid, only 10%, or 200mg, of the active omega-3 substance, docosahexaenoic acid, remains after our bodies have completed the process. Ovega3™life was designed to help meet the need for active omega-3 fatty acids in adults, teenagers and children over the age of 7. 200mg of high-quality, active plant-based DHA omega-3 fatty acid in oil from the schizochytrium sp. microalgae. The capsules are small, soft, gelatin-free and easy to swallow. This product is also suitable for vegetarians and vegans. Omega-3 fatty acids are essential. Our bodies cannot produce them and depend on our diet for these important substances. Omega-3 fatty acids are incorporated into the cell membrane and are crucial for their production and function. Omega-3 fatty acids positively affect blood lipid regulation. Omega-3 fatty acids affect brain and eye development in infants. The omega-3 byproducts, eicosanoids, influence numerous metabolic processes and functions. 60% of all fatty acids in the eye's retina and 40% or most unsaturated brain lipids are made up of the omega-3 fatty acid, DHA. Omega-3 reduces the negative effects of arachidonic acid, which is an omega-6 fatty acid and too much of which is consumed when we eat food products of animal origin. Omega-6 fatty acids affect our ability to absorb omega-3 fatty acids. Too many omega-6 fatty acids in our diet slows the absorption of omega-3 fatty acids. The 2000 German Nutrition Report and the 2003 Austrian Nutrition Report found that the population consumes too much omega-6 in their daily diet. According to the nutrition reports, the current relationship between omega-6 and omega-3 is 8 : 1. According to scientific findings, however, it should be 5 : 1. That means we need to reduce our consumption of omega-6 fatty acids like linoleic acid, gamma-linolenic acid and arachidonic acid and/or increase our consumption of omega-3. also referred to as triacylglycerol, are the natural forms of fat. All fats produced or stored by living plants or animals as energy reserves take the form of TG. TG is a compound of 3 fatty acids and 1 glycerol. In addition to TG, omega-3 capsules are also sold in different countries in the form of ethyl ester (EE). EE is an "artificial form", which means it does not exist in nature in that form and is more affordable than TG. Only natural TG oils are allowed in omega-3 products in Switzerland, Germany and France. Artificial EE is allowed in omega-3 products in countries such as the US. The DHA algae oil used in Ovega3™ is a natural TG product. Many people have difficulty swallowing large capsules. That's why we made the Ovega3™life capsules small. Capsules are often made from gelatin. Gelatin is an odorless, colorless, gel-like substance produced by cooking down connective tissue (skin, bones, sinew), which releases the protein mixture that makes up gelatin. Because of the BSE scare, many consumers are reluctant to consume products made from animal bones - like gelatin. That's why EnergyBalance™ decided to use a plant-based capsule in its Ovega3™life product. The Ovega3™life capsules are made from modified potato starch, are gelatin-free and are purely plant-based. Adults, teenagers and children over 7: Take 1 capsule daily with or without food. Do not chew. Made from the oil of the microalgae schizochytrium sp. with DHA omega-3 fatty acid in a small plant-based capsules. 200mg of high-quality, active plant-based DHA omega-3 fatty acid in oil from the ulkenia sp. microalgae.